Due to the organic bonding of the peat and coconut mix, the sponges will not disintegrate when you repot them. This keeps the root system intact and your seedlings will continue to grow faster and better after repotting. 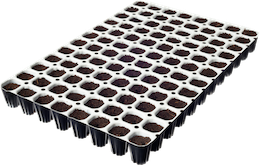 Spongepot is suitable for germinating all types of seeds, such as herbs, vegetables, flowers and plants, as long as they fit in the Spongepot. The included soil enhancer is a mixture of beneficial soil bacteria and fungi that promote the growth of a healthy root system. Just like in nature, your plants will be less susceptible to insect pests and plant diseases. 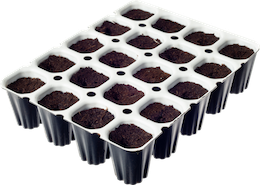 The Spongepots are packaged moist and thus retain their airy structure, which allows the roots to grow easily. Due to this airy structure and the added coconut soil an optimal air-moisture ratio is created; this ensures the young germs will not be over-watered quickly. See why Spongepot achieves the best results. Discover the secrets of simple and high quality germination. Do you want to sell Spongepot in your (online) shop or retail chain? Contact us or have a look at our retailpage. Vegetable, fruit, plants and flowers. Everything grows a Spongepot. The young plants are less susceptible to external influences. The enclosed soil enhancer promotes the growth of a healthy root system. Due to the airy structure the air-moisture ratio is optimal, making the roots grow easily. 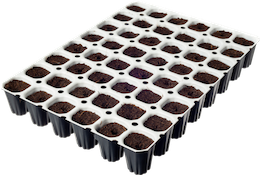 With the Spongepot plug-and-play germination kit we have thought of everything: sturdy trays, optimal organic soil mix with readymade seed holes, airy structure, available in multiple sizes and including organic soil enhancer. Simply put the seeds in and go! How to: Easy does it! When you start professionally as a hobby grower, you also want professional results! With Spongepot products, you are assured of exactly that! The time of seeds not germinating is over!